"The lucky ones live to feel guilty." So much has happened in the three years since the U.S. invaded Iraq that it seems impossible to grasp the human and political fallout of the war�a fact that is only compounded by continued conflict in that country. While the news struggles to report on the factual aspects of the war, Hollywood is now putting forth its best efforts to expound upon this chapter of U.S. foreign policy. In the case of television, Steven Bochco and Chris Gerolmo have elected to create Over There, a graphic look at the various battles our troops face. Premiering on FX in July of 2005, the series begins with Pilot. Written and directed by co-creator Gerolmo, this episode pulls out all the stops and pushes standard television's boundaries to the limit in terms of violence and language; but sadly fails to tell a realistic story about American soldiers. Shipping over to Iraq, a group of fresh-faced kids land in the middle of an intense firefight. Led by the grizzled Sgt. Chris "Scream" Silas (Erik Palladino), this platoon soon learns the full horrors of war as they charge a group of insurgents hiding in a mosque. The battle's unflinching depiction of war starts the show off on a high note, as does the astute character development. In the midst of the fighting, Pfc. Bo Rider (Josh Henderson) rises to the occasion, but he is quickly sent home after an IED blows off his leg. Throughout the rest of the season Bo strives to return to his unit, despite the objections of his wife, Terry (Sprague Grayden). Meanwhile, in Iraq, Sgt. Scream deals with the inquisitive Pvt. Frank "Dim" Dumphy (Luke MacFarlane), religious Pvt. Avery "Angel" King (Keith Robinson), troublesome Maurice "Smoke" Williams (Kirk "Sticky" Jones), and Bo's replacement, Tariq Nassiri (Omid Abtahi). Each episode splits its storyline between Bo, the platoon, and various family members. Each character, and there are far too many to reveal here, acts and speaks like a unique individual. Where the series falls into trouble is in its incessant desire to feature a major firefight every single week. While the war is certainly dangerous and violent, no single group of soldiers would be involved in this many battles in such a short time. One can forgive this inaccuracy, however, because of the fine acting and excellent filmmaking. Roadblock Duty is one of the series' finest episodes, with Scream and company guarding an empty highway during the night. California's geography passes for Iraq surprisingly well, with the barren landscape highlighting the platoon's isolation and vulnerability. Each time a car approaches, there's a genuine sense of fear about what will happen next. However, it is the quiet scenes that resonate with me the most. There's a somber storyline about a soldier's husband, Sergio (Lombardo Boyar), raising his child alone and falling in love with another woman in Orphans. I also find myself drawn toward the character of Tariq, a patriotic Iraqi-American who articulates the cultural differences with great profundity, revealing an extremely complex person. When he confesses to Dim that he's ashamed of his heritage in Weapons of Mass Destruction, the scene rings true and is far more compelling than any of the show's battles. Mixing 45-degree shutters and varying lens lengths, the show's directing staff never fails to create riveting battles. These scenes are marvelous entertainment and a grim reminder of the real war's brutal nature. Unfortunately, despite their technical proficiency, they become tiresome when absorbed in rapid succession. When Angel and an unstable medic (Currie Graham) attempt to save an armed Iraqi's son in Suicide Rain, it is reminiscent of a similar fight in It's Alright Ma, I'm Only Bleeding, in which the troops try to rescue a kidnapped journalist (Mark-Paul Gosselaar). The decision to focus on a major fight in each episode prevents the audience from getting to know the characters as well as I would hope. Thus, when the platoon is in danger of dying, there's an emotional distance that lessens the show's impact. Technically speaking, Over There is arguably the best show to ever air on television. The acting is equally impressive, from Erik Palladino's strikingly fierce Sgt. Scream to Josh Henderson's earnest turn as Bo to the brooding demeanor of Luke MacFarlane's Dim, and lends a touching human element. There's tremendous opportunity for the creators to improve and tell a more accurate, less action-oriented story about the war. Unfortunately, FX has yet to approve a second season (though numerous petitions are trying to change that) and it seems these 13 episodes might be it. Thinking back on the series, I applaud its creators for a sincere attempt to shed light on the war, but can't help but feel it missed greatness. Image Transfer Review: The 1.78:1 anamorphic widescreen transfer looks exceptionally good. In fact, I don't recall the original broadcast image looking this detailed and striking. Blacks are nothing short of amazing and the detail is amazingly sharp. Colors look exquisite, especially in Spoils of War. The only flaw is that on the rare occasions that documentary footage is used, the transfer highlights the disparity in quality. Audio Transfer Review: The Dolby Digital 5.1 audio mix is not quite as dynamic as I had hoped, but it is fully engaging. Rear-channel activity creates a nice ambience and highlights the musical score quite nicely. The front soundstage contains the bulk of the sound effects, with only occasional sound separation and directionality utilizing the system's full potential. Dialogue is crisp and always audible, though sometimes awkward sound design (such as placing a sound effect where it makes absolutely no sense) distracts from the scene's content. A Spanish Dolby Stereo mix is also available. Extras Review: Fox gives Over There a nice collection of special features. There are three episode audio commentaries, beginning with co-creator Chris Gerolmo and producer Joan Gerolmo on Pilot. The two spend the bulk of their time explaining the various technical aspects of filming an episode, but offer some brief anecdotes about working on the show. The second commentary, by USMC Ssgt. Sean Bunch and Sam Sako, is on It's Alright Ma, I'm Only Bleeding. The two were technical advisors on the show and their input here is wonderful, as they shift gears between critiquing the show's accuracy to explaining their own experiences in Iraq. The last commentary, on Spoils of War, features virtually the show's entire cast of regulars. Unfortunately, their remarks here are far from enlightening. Everybody talks over everyone else and pretty much spend the entire track joking with one another. In addition to those three commentaries, there's a featurette, Weapons Debriefing (05m:52s), on Disc 1. Armorer Vince Flaherty gives a quick overview of the guns used on the show and explains the functions of each one. He also does a good job of discussing each weapon's practical purpose and the ideas that went into making it. For those not into military hardware, a feature-length making-of documentary can be found on Disc 4. Tour of Duty: Filming Over There (01h:20m:09s) follows the cast and crew during the finale's seven-day shoot. Featuring an impressive amount of behind-the-scenes footage and interviews with Steven Bochco and several others, this is a thorough look at the television industry's frantic production schedule. Just about every aspect is touched upon, creating one informative and compact documentary about show business. 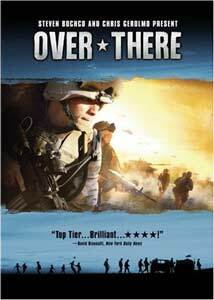 Over There is a graphic look at the Iraq War that doesn't quite balance its Hollywood action quota with the war's realities. Nevertheless, technically this is an amazing accomplishment and there are some nice ideas that come across in these 13 episodes. Fox gives it due respect with this four-disc set, providing stellar transfers and compelling extras.